and save 55% or more. Glass Bottom Dishes are used in the fields of Life Science and Environmental Research, Molecular and Cell Biology, Cell Culture and Cell Physiology, Biotechnology, Neurology, Pathology, Pharmacology and more. 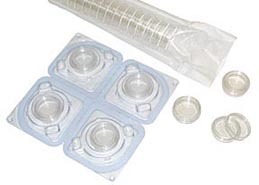 These sterile tissue culture grade polystyrene glass bottom WillCo Wells Petri dishes with lid are available in two sizes, 35 x 10mm and 50 x 7mm, with clear or black plastic sidewalls. Through their advanced design features, they provide exceptional image quality needed for use on inverted microscopes and for applications such as high – and super resolution image analysis, microinjection and electro-physiology recording of fluorescent-tagged cells. The WillCo Wells glass bottom Petri dishes use a special formulated adhesive with a low toxicity that is durable and optically clear. Glass thickness stays within 0.17mm and ra ±0.005mm and permits use of immersion objectives with water, glycerine or oil. The glass bottom is flush with the microscope stage or heating stage to ensure absolute flatness and optimum heat exchange. The optical quality of the glass bottom provides a higher effective numerical aperture (NA) producing brighter high resolution images in all types of microscopy applications. 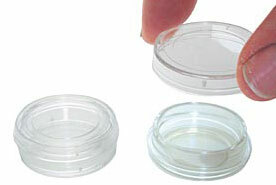 The 50mm WillCo Wells glass bottom Petri dish features a low rim side wall. The low side wall allows easier access for micromanipulation/microinjection probes. 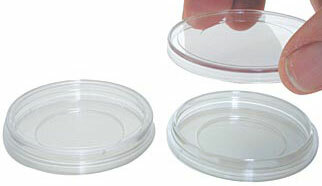 The WillCo Wells Glass Bottom Petri dish is available in two sizes: 35mm diameter and 50mm diameter. Both sizes are available with clear or black side walls. The 35mm dish will be compatible with most 35mm heaters and perfusion adapters. The 50mm dishes, ‘Series 5030’ and ‘Series 5040’, have a well of respectively 30mm and 40mm, both providing a large growth area. They have a low access angle and an "easy grip" handling. Easy "perfusion" in the dish for continuous in and outflow of solutions, using "perfusion chamber insert", for life cells. Fertility & Infertility ICSI, spermatid identification, assisted hatching, embryo biopsy, genetics, etc. (Cell-) Physiology Patch clamping, ion-imaging, etc. Pathology Studies e.g. on the morphology of particles and cells, etc. Neurology Axon growth, in and efflux studies of electrolytes, etc. Cell Biology Cell-cell communication studies, tissue culture, etc. Molecular Biology Studies on genetics (DNA), enzymatic activity, etc. Pharmacology Cell research, in and outside the cell on all levels. Plant Physiology Root hair growth, micro-parasites on roots, etc. The black dish, absorbs more scattering light (Considered debris!). The black dish, working in a dark room, makes one see the meniscus of the media much better. The black dish, when lid (black) is closed, protects the cells inside completely, from light. Build your own Glass Bottom Dishes and save 55% or more compared to the pre-assembled product. 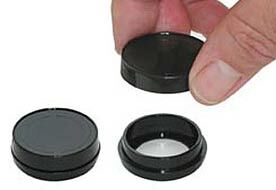 This easy do-it-yourself kit is available in two dish sizes and four bottom aperture sizes, with clear - or black walls and lids. Special two-part Assembly Device (available separately) made of high quality anodized aluminum serves to safely, precisely, easily, and quickly position the adhesive ring and the glass coverslip bottom and evenly distribute the gluing pressure. The assembly routine is very simple and clean, it does not involve messy glues or the need for precise aim and motor skill. A ring of matching diameter carrying the specially formulated adhesive is peeled off its backing and mounted onto the blue part of the Assembly Device. The dish bottom, guided precisely by the top protrusion of the Device, is then pressed firmly on top of the ring. 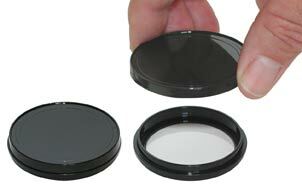 This achieves transfer of the Double Sided Adhesive (DSA) ring onto the dish bottom. Now take the second silicon liner of from the ‘DSA’ ring and the now sticky dish is pressed against the corresponding glass coverslip, which has been secured within the special slot in the red part of the assembly device. After four hours at room temperature to allow the bonding to complete, the newly made glass bottom dish is ready to use. Detailed assembly instructions are included with each WillCo Wells kit. Each kit is supplied with #1.5H thickness and ra 0.005mm coverslip glass bottoms, unless specified as #1 when placing the order (custom). The Assembly Device is a set of two high quality tools precision-machined from anodized aluminum. It serves to precisely position the adhesive ring and the glass coverslip bottom and evenly distribute the gluing pressure. 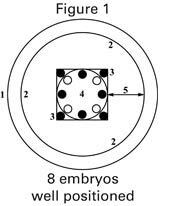 A separate Assembly Device is offered for each bottom aperture size: 12mm and 22mm Devices for the 35mm dish size, larger-sized 30mm and 40mm devices for the 50mm dish size.